Already in the immediate future Russia will commence with the construction of aircraft carrying cruisers. Such an assignment to Minister of Defense was given by Supreme Commander-in-Chief, President of Russia Dmitriy Medvedev. However the latest (the only one in the lists of the Russian Navy at this moment) aircraft carrying cruiser Admiral Kuznetsov was launched back in 1985. But how to make up for lost time? If to commence immediately the first results could be obtained by 2013-2015 considers Medvedev. What kind of results will they be? According to experts questioned by Izvestia an aircraft carrying cruiser should be flexible on one hand not coming short of performance standards of American aircraft carriers and to be able to fight for herself on the other. It means she should not only be a floating airfield but equipped with both assault weapon and self-defense means. And no mistake she should have nuclear power plant. Aircraft carrying cruiser is not mere aircraft carrier in the American meaning of this word. For the Americans she is a floating airfield above all things. 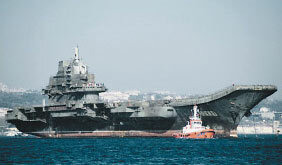 The very Admiral Kuznetsov is called “a cruiser with aircraft armament”. Whatever paradoxically it sounds but the primary sea battle weapon at Kuznetsov is not aircrafts but long-range winged missiles Granit. Missile shafts of the ship are located right beneath the flying-off deck. Besides the cruiser is armed with quite powerful antiair warfare system that allows the cruiser to operate rater independently. But why there is such a difference? As one of the legends says, Admiral Sergey Gorshkov who is considered the father of the Soviet Navy anyhow did not want to liken Soviet ships to American ones. That time aircraft carriers were referred to nothing but “instruments of world imperialism”. Should the designers of that time have referred heavy aircraft carrying cruiser to as "aircraft carrier” then the top echelon of the Soviet party could cancel the project hotheadedly. The Admiral simply could not let that happen. According to Gorshkov’s comrades-in-arms he personally introduced a new class of ships into the Navy - aircraft carrying cruiser. Having obtained double name she got double functions as well: be a take-off strip and wing support ship simultaneously. Upon breakup of the Soviet Union neither forces nor facilities were enough for construction of aircraft carrying cruisers. The necessity of aircraft carrying fleet re-establishment started being spoken just recently. For Instance Vladimir Vysotskiy Russian Navy Commander-In-Chief even declared that Russia needs at least six such ships, three each for Northern and Pacific Fleets. Moreover not mere aircraft carriers in today’s meaning of this word but naval aircraft carrying systems. “Everything should work in one system including aircraft carriers”, said Commander-In-Chief. “We called it naval aircraft carrying system (NACS). The ships will be in close coordination with space-based assets. The more so the NACS’s will have to be in similar close contact with Air Force and air defense systems. Research and development in this field are already underway at the moment. Governmental weapons program till 2015 sets fleet’s upgrade to equal level with the development of deterrent strategic nuclear forces. This means it is of top priority. Out of total 4.9 trillion rubles allowed for Forces refit 25% of it captured for replacement of warships. By 2010 in Russia It is planned to increase number of warships built one and a half times as much. For the first time for the last 15 years a whole series of 40 frigates have been laid down. The funds for the aircraft carriers were not mentioned till now. One of the problems is that there is merely no place to build them today. Although yet before Medvedev announced the necessity of aircraft carrying fleet re-establishment, the construction of floating dock capable to ensure building of ships with more than 100 thousand tons of water displacement started in Severodvinsk. It is planned to spend about $500 million of budget funds for this dock. This dock will be able to launch both tankers and bulk-carriers and it seems to be the only way to fall on creation of new aircraft carrying cruisers. The project of such cruisers is being developed since 2005. According to Navy officials the length of aircraft carrying cruisers makes no less than 100 meters, and they have enough space to accommodate 30-40 aircrafts. The cost of one carrier is about $2 billion. After simple calculation it becomes obvious that Forces refit program needs amendment in order to have enough funds for the construction. “We of course need aircraft carrying ships, that is why I consider the decision of their construction start right and timely”, said former Northern Fleet Commander-In-Chief Vyacheslav Pavlov in his interview to Izvestia. “Russia used to have, has today and will have geopolitical interests in the world and the Navy gives n aopportunity to defend such interests”. Where did Soviet aircraft carrying cruisers gone? By early eighties there were 4 aircraft carrying cruisers of Baku class in the USSR Navy. Every one provided base for up to 34 flying machines: 18 anti-submarine helicopters Ka-27 and Ka-27, 16 vertical takeoff and landing fighters Yak-38. Simultaneously construction was commenced of aircraft carrying cruisers of project 1143.6 with standard flat flight deck that allowed accommodation of Su-33 fighters. 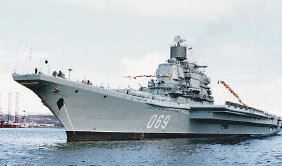 However by the time of breakup of the Soviet Union only one – Admiral Kuznetsov was commissioned. Cruiser Varyag with 70% completion was cut into “needles”; the same fate was shared by nuclear aircraft carrying cruiser Ulyanovsk. Even more hard lot expected 4 ships of Baku class. The piers for them were simply “forgotten” to build. As the result the ships were constantly anchored at the roads shortening their service life and eventually were discarded due to “premature senility”.